Crewe boss Steve Davis has branded referee David Phillips and his two assistants 'inept' for their display in Saturday's 2-0 defeat at Portsmouth. Davis accused Wes Thomas of diving to earn the crucial first-half penalty that brought Pompey's second goal. 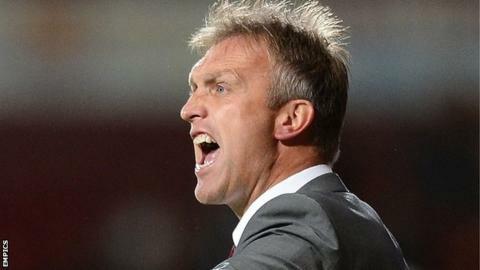 He was also upset by a challenge on AJ Leitch-Smith that looks like losing him his young striker for at least a month. "It was a really poor, inept performance from the referee and his two officials," Davis told BBC Stoke. After being stung by a second-minute goal for Thomas, Davis was further angered when a foul by home defender Lubo Michalik on Crewe striker Mathias Pogba failed to procure anything more than a free-kick. "Their centre-half cynically bodychecks Pogs when he was in on goal and didn't even get booked," said Davis. "Then he does get booked and that's a game-changing situation. "He should have had a red card. They'd have been down to 10 men and that would have given us some impetus." Davis also insists that Andy Bond made no contact with Thomas when he went down for Pompey's crucial penalty midway the first half. "I felt that it wasn't a penalty," added Davis. "He didn't touch him. "I thought he dived. And, when you watch it, you can see that he dived. "Although he sticks his foot out, he doesn't make any contact. That was a poor decision." And, to cap an out-of-character post-match rant, Davis was further upset by Brian Howard's challenge on Leitch-Smith 10 minutes after the penalty, which has left him with knee ligament damage - and awaiting the result of a scan. "He went through AJ to get the ball and deservedly got a yellow card," continued Davis. "AJ's come off worse. Something to do with his ligaments and he'll be out for a while. "I think they had six booked in the end. "But the referee and his two assistants got a lot of decisions wrong, particularly the penalty."